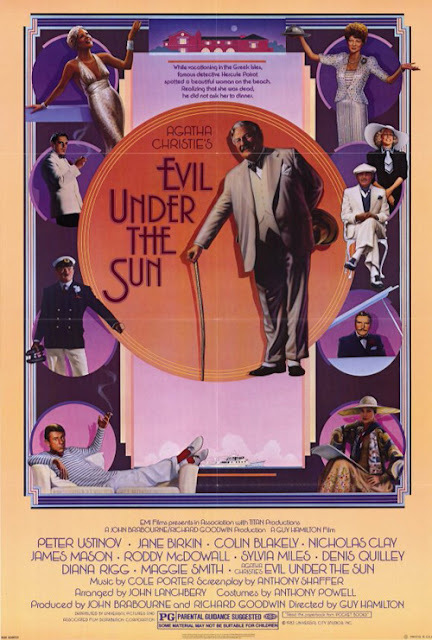 Peter Ustinov’s second outing as Hercules Poirot (following 1978’s Death on the Nile) and Guy Hamilton’s return to Agatha Christie (his first was 1980’s The Mirror Crack’d). Ustinov would play the Belgian detective four more times during the ‘80s, although only one of these would garner a cinema release (no doubt due to the illustrious talent behind the camera on that occasion; Michael Winner). As such, this tops off the run of Christie adaptations as prestige projects that initially found favour with Sidney Lumet’s Murder on the Orient Express. It’s an entirely competent affair. A smattering of big and not-so-big names from movies and TV (Diana Rigg, Maggie Smith, James Mason, Roddy McDowall, Jane Birkin). Nicholas Clay must have thought he had it really made about this time, with Excalibur then this following in quick succession but now, rather like Stephen Collins, he’s at best a “Oh, wasn’t he…?”. It’s the usual mix of every cast member having clear reasons to commit the deed and then Poirot voicing his suspicions at every opportunity. The location is perhaps the biggest star; filming took place in Majorca, rather than an island off the Devonshire coast as in the novel. That, and Ustinov’s pompous charm (far more appealing than the stiff David Suchet) carry the mystery off appealingly. Of the guest cast, it’s unsurprising that Roddy McDowall who steals every scene he’s in.